B4C is excited to have teamed up with GiveNow. 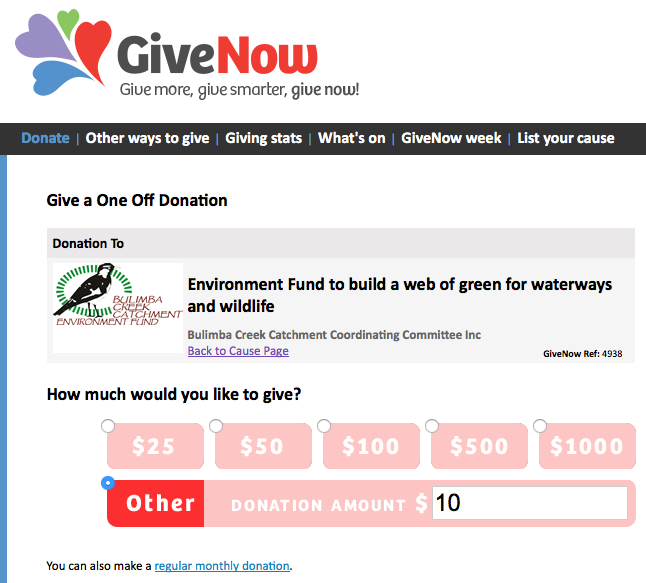 Thanks to GiveNow’s very simple and secure facility, people can contribute to the Bulimba Creek Catchment Environment Fund really easily. End of financial year is an ideal time to consider charitable giving. All donations over $2 are tax deductible. You choose the amount that is right for you and you will be emailed a receipt immediately. The fund helps deliver important outcomes – from providing trees to local schools or groups assisting wildlife to providing training to a community volunteer to carry out critical rehabilitation work. Please don’t hesitate to contact us if you would like to know more about what we do. View examples of what our fund achieves. Make a donation or view the donations gauge here.